It’s the first day of the school year and Carl, a sixth grader, is dreading getting up. A happy, confident child during the summer months, Carl is sullen as he dresses for the first day of school. Except for Bs in math and art, Carl got all Ds on his last report card. He especially struggled in reading. He dreads reading aloud because he often mispronounces even simple words. When the teacher asks about the reading assignment, Carl usually doesn’t know the answers. If he does, he has a hard time quickly putting the answers into words when called on. He also hates going outside of class with the resource teacher for science and social studies. If only the textbooks were easier to read! Carl’s experience with reading is not uncommon  it’s typical of students with dyslexia. As students progress through school, they need better reading skills each year to understand textbooks and do well in subject areas. If they don’t develop these skills, they get further and further behind. Self-esteem falls, and an academic crisis develops. According to the International Dyslexia Society (IDA) people with dyslexia have difficulties translating language into thought, and thought into language. Dyslexia is characterized by problems with expressive and receptive language that are usually related to inadequate phonological processing. This causes difficulties in reading, writing, spelling, handwriting, and sometimes, mathematics. 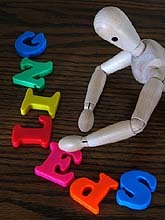 Dyslexia is a problem with language, not intelligence. In fact, many experts limit a diagnosis of dyslexia to students with IQ scores over 80. As with many other learning disabilities, unexpected underachievement is a classic characteristic. People never outgrow dyslexia, but they can learn to cope and to succeed in school and life with appropriate interventions. The term dyslexia is sometimes inappropriately used to describe any type of reading difficulty, but not everyone who has a reading problem has dyslexia. Some people who read poorly have garden-variety reading problems due to factors such as inadequate instruction, below average intelligence, or poor motivation. Reading problems may also be associated with visual or hearing impairments, attention deficit disorder, general development disability, or other conditions. These factors may coexist with the dyslexia but they don’t cause it. Dyslexia is inherited, runs in families, and is thought to be caused by brain and chromosome differences. People with dyslexia often have remarkable talent and excel in art, science, and technical fields. Some famous people thought to have been dyslexic include Albert Einstein, Winston Churchill, Hans Christian Anderson, Woodrow Wilson, Leonardo da Vinci, Thomas Edison, George Patton, William Butler Yeats, Nelson Rockefeller, Bruce Jenner, and Tom Cruise. But Julian Elliott says dyslexia does not exist  at least, not in the way we think it does. His views have earned him hate mail, but, he says it's time someone spoke out. Tens of thousands of pupils are being falsely diagnosed with dyslexia because parents and schools failed to teach them to read properly. Professor Elliott, of Durham University in the UK, said parents whose children have trouble with reading often push for the dyslexic ‘label’ simply to secure extra help for them. But in fact there are many children who simply struggle to read and require help at an early age. He voiced his concerns as figures suggested a steep rise in the number of children being termed dyslexic. Professor Elliot said that around one in ten children  more than a million  are now diagnosed with the condition, up from barely any two decades ago. Figures from exams watchdog Ofqual have shown that the number of candidates granted extra help to pass their exams has doubled in just three years. Schools agreed 105,000 requests for special assistance during exams in 2008  usually in the form of extra time  compared with 44,000 in 2005. They have the discretion to agree up to 25 percent of extra time  45 minutes extra for a three-hour exam. The surge in diagnoses has led to claims that, for some children, dyslexia is a ‘middle-class badge for illiteracy’. Professor Elliott, Director of Research at the University’s School of Education, said: “Many of the messages that I have received from parents have pointed out that the system has forced them to use the dyslexic label in order to access additional resources. He stresses he would rather identify all children with literacy difficulties at an earlier age, than see parents fight for dyslexia diagnoses.